A part of me doesn’t really want to spread word about Tbilisi at all. This place is the way the world’s cities used to be before the arrival of mass tourism – and I love it. From the visitor’s point of view, the Georgian capital comes close to perfection; it’s beautiful, cheap and offers stimulating conversation. The streets are safe and the food is exquisite. What more could one possibly ask? If one were determined to gripe, then the heat of high summer could be counted against it. As I write on August 3, BBC Weather says the maximum temperature today will be 39C – the same as Khartoum, which stands out in my memory as one very hot city. 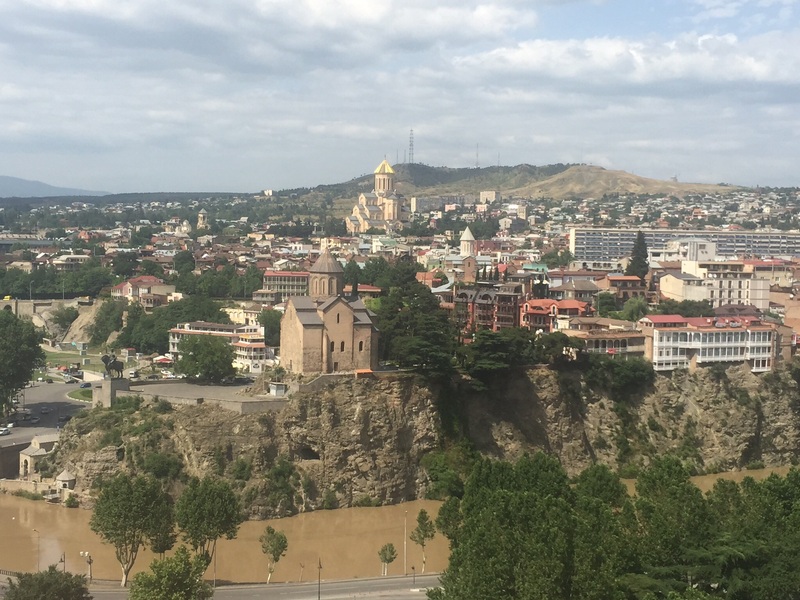 The first thing that struck me when I saw Tbilisi was the dramatic topography, the cliff rising up sheer on the northern side of the Mtkvari river with a church and other buildings perched on top. I still find this view thrilling. The other thing was the charm of the main boulevard, Rustaveli Avenue, with its plane trees soaring to the heavens, the well-dressed women and the lovely balconies of the houses, a feature in much of Tbilisi. So, a city that marries drama and elegance. The topographical extravagance does not end with the cliff. If you wander past Tbilisi’s sulphur baths on the south side of the river you soon come to a canyon and a waterfall. A serious waterfall in the middle of a national capital! Then the land rises steeply to the Solalaki ridge on the southern side of the city, with the Mother Georgia (Kartvlis Deda) statue and the ancient Narikala fortress. On the other side of the ridge stretches the green expanse of the National Botanical Garden of Georgia, all 161 hectares of it. Scattered here and there are examples of ultra-modern architecture. Much of this, to my mind, does not blend with the rest of Tbilisi. The buildings seem to be there to polish Georgia’s credentials as part of modern Europe. 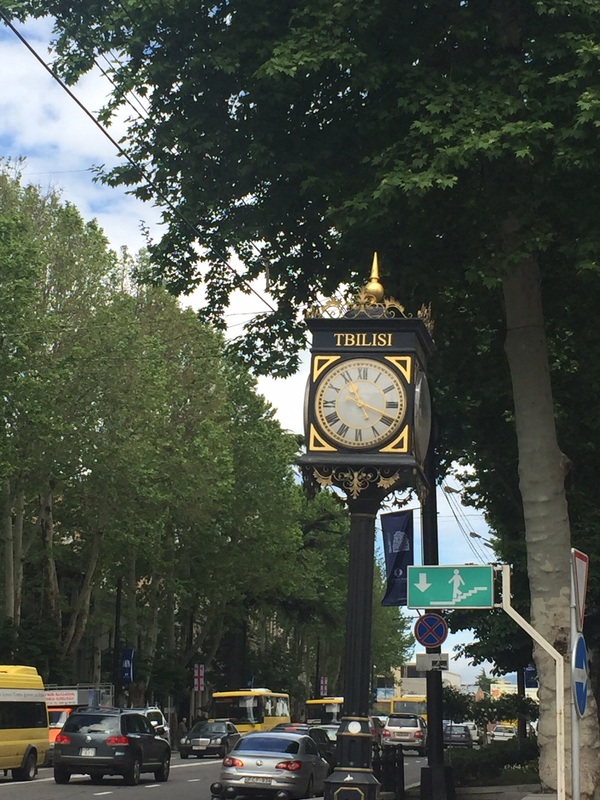 But it’s clear that in human terms Tbilisi is not a carbon copy of West European capitals. People here are ploughing their own furrow. For example, Tbilisi’s churches are full to bursting. When I went to the city’s Sioni cathedral it was packed with worshippers of all generations. The canny ones were outside seated on benches in the courtyard – more comfortable than standing inside. I like to call it the University of the Road – the knowledge one gains from others when on the move. Tbilisi has a particularly lively branch of this august institution. One of my teachers is Yuri Millarson. The first time I met him in a Tbilisi hostel I learnt just the basics – he is from San Francisco and he’s named after Soviet cosmonaut Yuri Gagarin, the first man in space. In later conversations I realised that Yuri lives, breathes, eats and sleeps the Caucasus like no one else I have ever met. His knowledge is extraordinary and his ideas on day trips unconventional. One evening he told me that the next day he hoped to go to the Pankisi Gorge in eastern Georgia to brush up on his Chechen grammar with the Kists. The trip didn’t happen in fact, but the conversation improved my knowledge of the ethnic mosaic of Georgia. The Kists trace their origins to the Chechens of the North Caucasus. Yuri, who is 43, hangs out some of the time with Georgian bikers. He describes himself as an anarchist and he has one very big idea. He wants to foster a sense of the cultural unity of the Caucasus, north and south, so that eventually the peoples of the region can move towards some kind of political union. “And then there was this thing about my grandmother,” added Yuri, “my grandmother who was living on the Black Sea coast when she was a little child with her mother.” He said the draw of the Caucasus was like going back into an ancestral past, like “a 1000-year-old smell”. Yuri said that for more than 20 years he had been thinking about the unification of the Caucasus, about breaking down what he called “the manufactured distance” between people on different sides of political borders. “Georgians know very little about Chechens, for example, even though they are direct border neighbours,” said Yuri. Since the breakup of the Soviet Union, Chechens have fought two independence wars against Russia but are still part of the Russian Federation. Immediately after my first conversation with Yuri about Caucasus unity, I met two delightful young Russians from the North Caucasus, a brother and sister in their 20s. Our paths crossed briefly in a restaurant and we arranged to meet again the next day. They were Russian citizens of ethnic Armenian stock, visiting family in Tbilisi. They seemed almost to be embodying Yuri’s idea of Caucasus unity. We ate ice cream and chatted for hours about life, the universe and everything. He was a lawyer, she was a teacher of English. Sometimes you hear the view in the West that Russians are brainwashed by their media into believing what their government wants them to believe. The brother and sister told me, however, that they had completely stopped watching Russian television. Her favourite viewing was Downton Abbey, not renowned for its Kremlin propaganda. Memories of a few excursions and hangouts in Tbilisi will stay with me. At the weekend Yuri and I set off to visit the ruins of a Zoroastrian fire temple. Our taxi driver repeatedly got lost and eventually dropped us somewhere close. We asked several Georgians to direct us to the spot but just got blank looks. Eventually a foreign tourist showed us the way. Perhaps it was the summer heat, but it then took us half an hour to get in. We finally knocked on the right door and a man opened up what looked like a private home. He pointed languidly to the temple entrance and disappeared. The temple, called the Ateshgah, is a cuboid brick structure in the south of the city below the Mother Georgia statue and just to the east of the Zemo Betlemi church. It is without windows and essentially featureless. 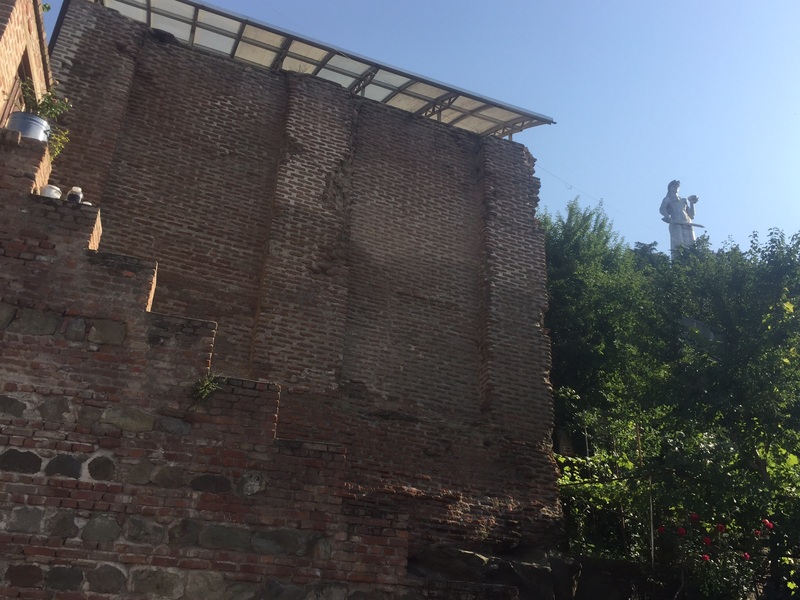 A sign outside says it was probably built between the fifth and seventh centuries, when Zoroastrianism was spreading in Georgia. The point in going was not to savour architectural greatness, but to get a sense of contact with a very distant past. Zoroaster, the religion’s founder, lived in the first or second millennium BC in ancient Iran and developed a monotheistic religion with concepts of heaven and hell. The religion still exists, mainly in India. In an utterly different vein, one day back in May I dropped into Betsy’s Hotel, a favourite haunt of the British. An Englishman stood at one end of the bar, with beer in one hand and cigarette in the other. He held forth on how best to prepare camel for the table. I caught snippets. “Has to be a young camel…Bury for seven hours.” He delivered his culinary tips with such poise and assurance that it was easy to believe the English were forever dining off camel, before moving on to the apple and blackberry crumble and the port. My most frequent haunt has been Kala in Old Tbilisi. There I listen to an old-timer with twinkling eyes play the drums with all the mellow tunefulness of advancing years, while two younger musicians accompany him on cello and piano. Occasionally female vocalists put in an appearance, seated precariously on a high stool (one at a time, of course). Kala also does a great mint-flavoured lemonade, which hits the spot nicely in this heat.